USM: K.Hardy 10-35; J.Richard 4-24; T.Bracken 7-9; J.Hester 3-5; Team 1-minus-2; A.Bridgford 2-minus-9. NEB: A.Abdullah 17-114;  T.Newby 8-60; T.Martinez 6-34; T.Armstrong 4-23; K.Frazier 4-21; I.Cross 4-14; G.Nabity 2-10; R.Kellogg III 1-9. USM: A.Bridgford 21-35-3 222; N.Mullens 0-2-1 0. NEB: T.Martinez 15-23-0 170; R.Kellogg III 4-5-0 24. USM: T.Holmes 8-65; R.Bradley 3-57; T.Bracken 2-34; J.Richard 2-14; J.Revies 2-12; M.Triplett 1-15; J.Sims 1-13; J.Cox 1-7; D.Sullivan 1-5. NEB: Q.Enunwa 5-58; A.Abdullah 4-16; K.Bell 3-45; J.Westerkamp 2-15; S.Burtch 1-26; C.Carter 1-12; J.Turner 1-9; T.Newby 1-minus-5. Ameer Abdullah runs past Jerrion Johnson in the second quarter. 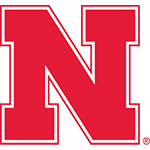 Huskers soar past Golden Eagles: Nebraska’s Blackshirt defense hauled in four interceptions and returned two of them for touchdowns, while Taylor Martinez threw three touchdown passes to lead a balanced offense in a 56-13 win over Southern Miss. 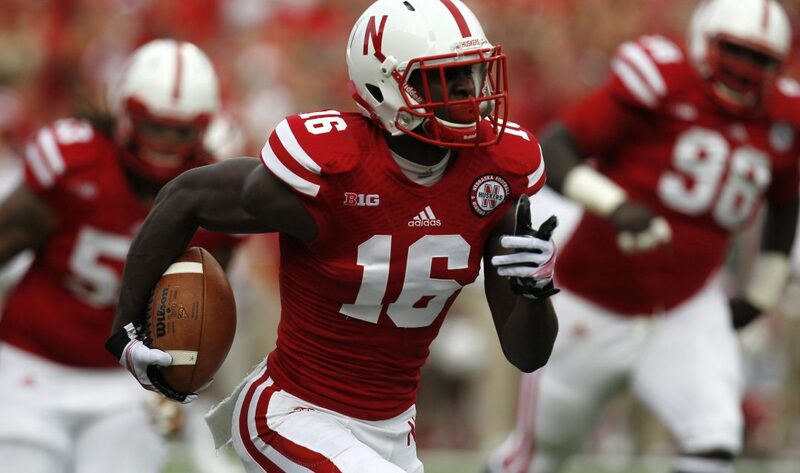 Nebraska finished with 479 total yards, including 285 rushing and 194 passing. I-back Ameer Abdullah led NU’s ground game with 17 carries for 114 yards. USM had just four rushing yards until midway through the fourth quarter. • Southern Miss Falls To Neb. Randy Gregory had four QB hurries. Pound for pound, Bell is the toughest Cornhusker, both physically and mentally. 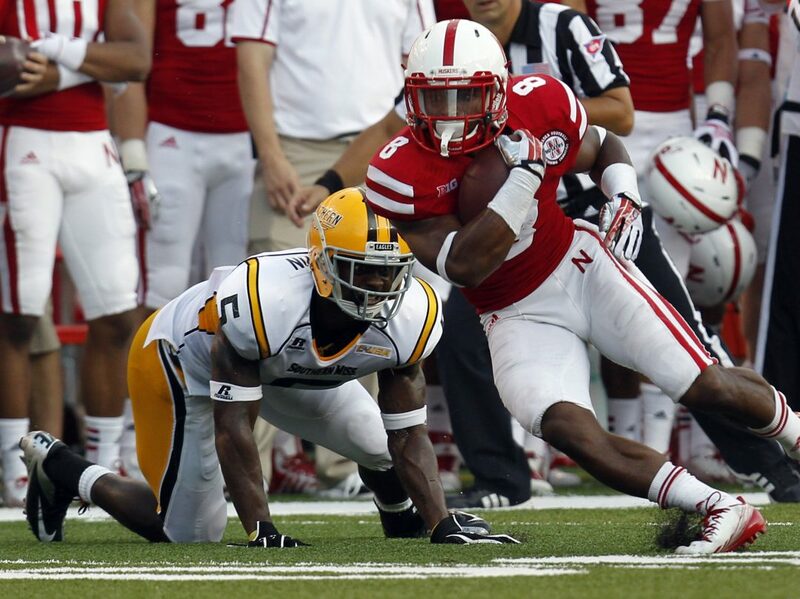 Nebraska paid Southern Miss over $2 million to play in Memorial Stadium on Saturday, and it was worth every penny. Nebraska was dialed-in. The Huskers’ body language was good from the start. 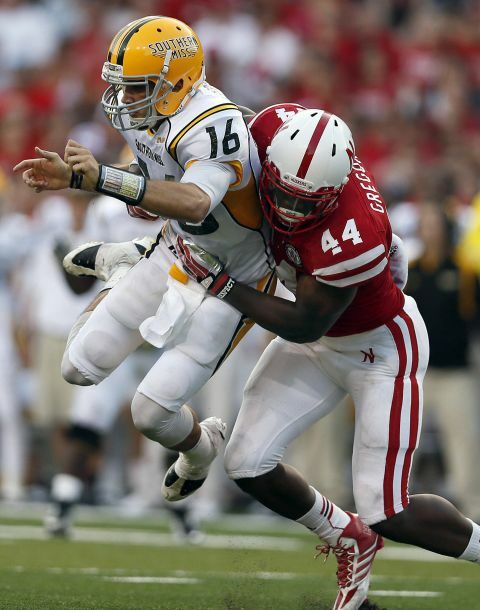 Gregory is ... the explosive edge rusher Nebraska desperately needs. There is no relaxing – not for the coaches, players or fans. It’s now UCLA week. We’ll know more a week from now. But we won’t see the finished puzzle, not by a long shot. It was less storm, more calm before the snap and it made a difference elsewhere. Offensively, it was another slow start for Nebraska, and I’m growing increasingly concerned about the offensive line. I liked the pass rush, even though there weren’t any sacks. Gregory is showing signs of being a rather menacing pass rusher on the edge.